​Beach entry or sometimes called zero entry swimming pools can add an attractive and fun look to your pool. A beach entry pool is a pool with one of entry sides of the pool gradually sloping from the decking into the pool water. Beach entries can have steps at the end of the slope to enter deeper into the pool more quickly. Beach entry pools are gaining more popularity these days not only because of their spectacular look but because they also serve some practical purpose. Beach entry pools make it easier for elderly person’s and people with disabilities to enter the swimming pool. Beach entries are also a fun spot for small children to play and enjoy the water. Because the water is shallower at the beach entry, it is an ideal spot to relax and even sun tan while getting the benefits of cooling off with the water. A tanning ledge or sometimes called a sun shelf is another attractive feature you can add to your swimming pool. By definition, a tanning ledge is perfect for sunbathing while being submerged in just inches of water. A tanning ledge is basically like one big step submerged in anywhere from 3 to 18 inches of water. To really make your tanning ledge look great you can add bubbler fountains or even a built in umbrella. Tanning ledges are perfect for small children to play in the water while making it easier for adult supervision. Tanning ledges can also be seen as more in pool seating square footage. You can also purchase furniture specifically for tanning ledges making your experience that much more comfortable and relaxing. If you’re thinking about a beach entry pool or a tanning ledge, ask our team at Manny Pools, LLC about the many options. Also feel free to explore our website or other websites for more examples we can add to your project. Don’t forget about the added features such as bubblers, furniture, and built in umbrella anchors. All swimming pools require physical filtering of pool water. For in-ground pools there are three main types of pool filters for this process, they are sand, Diatomaceous earth (DE), and cartridge filters. Each filter type has its unique advantages. Choosing a filter depends on what the customer is looking for out of their swimming pool or what is important to them. Sand filters are the oldest and probably the most common type of swimming pool filter. A sand filter tank is filled with about 2/3 pool sand (silica sand). The pump brings water to the top of the sand filter, and the water is dispersed evenly on top of the sand and forced down by pressure through the sand. The sand granules trap debris, silt, and oily deposits between the grains. Although the sand filter does a good enough job filtering unwanted deposits, it can only trap debris as small as 20-40 microns (the least efficient of the three types of filters). Also, a sand filter requires some maintenance. Although the maintenance is not difficult, there are some weekly/monthly and yearly duties. When the sand filter reaches a certain pressure, it is time for backwashing. Backwashing basically runs the pool water in reverse through a designated backwashing pipe to rid of all the collected debris. This process can waste a lot of water from the pool along with any chemical additives that were placed in the pool. Eventually, sand will need to be replaced every 6-8 years. A sand filter will filter your pool to most people’s satisfaction and is typically the least expensive out of the three filter types making the sand filter the best fit for your pocket. A Diatomaceous Earth or DE filter is different in that is uses a different filter media in the form of DE powder. The DE powder is coated on fabric covered grids. 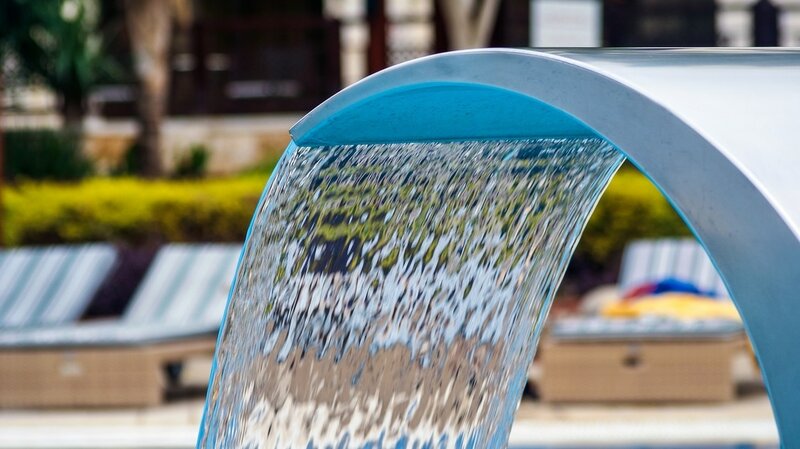 When pool water passes through the grids, the DE powder traps particles as small as 3-5 microns making the DE filter the most efficient in filtering. DE filters also require backwashing when filter pressure rises to a point. When backwashing is performed on a DE filter the DE powder is discarded along with the debris. DE powder will need to be replaced into the skimmer after backwashing. Some states require a separation tank to be plumbed into your system for the used DE powder so that the DE does not get into sewers or streams. DE filters are the best in filtering your pool water removing debris 3-5 microns in size, but it is the most expensive, requires the most maintenance, and because the filter has many parts, disassembling the filter for maintenance raises the probability of damaging and replacing parts. With this said if water clarity is the goal DE is the best form of filtration available. Cartridge filters use a pleated polyester type material as its filtering media. Water is forced through the pump to the filter and through the layers/sections of polyester trapping debris 10-15 microns. Filtration for cartridge filters is more efficient than sand filters but cannot filter as well as DE filters. Still 10-15 microns is pretty good and more than likely will not be able to see the difference from DE efficiency. Cartridge filters also do not require backwashing, so it does not require added backwashing valves and ports putting less stress on your system saving you energy. To clean cartridge filters, you simply shut the pump off disassemble the filter, remove the cartridge cylinders and hose the debris off. Having a larger cartridge filter will require less cleaning and maintenance than a smaller filter, so it is sometimes better to go bigger for longer in between cleaning cycles. Most other filters require sizing depending on the pump rating. Cartridge filters are the most environmentally friendly because they cause less stress on your system and do not require water and chemical wasting backwashing. All three filters will filter your pool, but some cost less, filter better, requires less maintenance, or are more environmentally friendly. It really depends on the person and what they want to get out of a filter. I tend to lean more towards cartridge filters but if cost is a factor a sand filter might be best or if you want crystal clear water and don’t mind expense and maintenance than a DE filter might be best. It’s all up to you. ​ Swimming pools have been around since the beginning of civilization. Evidence of swimming and bathing pools date back to 9,000 BCE in the “cave of swimmers” in the Egyptian desert. Proof of swimming pools can be found in some of the earliest histories of Egypt, China, Greece, and Rome. Swimming was considered so essential to human life in these regions that Plato the Greek philosopher has stated: “man could not be considered learned if he could not read, write, or swim.” The Greeks may have been the first to establish round shape swimming pools. The Greeks also utilized cold plunge swimming pools for competitive sports and therapeutic reasons. The Romans preferred a more rectangular shape pool with natural spring fed water designs. The Romans also are thought to introduce warm water pools for therapy and relaxation reasons. Being able to swim was so important that Roman author, politician and general Julius Caesar has stated that every soldier must be a swimmer and must be able to pass a rigid swimming test. Some of the earliest pools used stone, brick, gypsum mortar, bitumen, and/or marble to create water tight pool walls. Many public baths and pools used a combination of natural rivers and lakes and manmade materials to modify bodies of water for swimming, bathing, and therapeutic purposes. In the middle ages floating pools made of wood were popular. Having a floating pool in a river or lake with wooden wall barriers allowed constant natural water circulation, a method used for better water sanitation. Today swimming pools are more popular than ever, and the many safety regulations, precautionary safety tools, and publicly offered swimming lessons are giving more people a comfortable sense of owning a swimming pool. Today pool sanitation and circulation has become much easier and more efficient, and the technology is becoming more advanced every day. Swimming is not only fun for the family but has been gaining tremendous popularity in competitive sport. Private clubs, high schools, and colleges compete in swimming events all around the nation. Of course, countries from all around the world also swim competitively. In the Olympics, countries are competing for gold, and there is no other Olympic swimmer like our very own American Swimmer Michael Phelps and his current 28 medals. Most of us (if not competing) when swimming are fully engaged in fun but, unrealized are also getting a full body low body impact (therapeutic) workout. Hence the popularity of the pool and the sport! With a concrete pool your “must haves” can be completed and with so many options you may discover a previously unheard of “must have!” What are some of your swimming pool “must haves?” I know as a dad it would probably be a diving board, for my wife probably a sun shelf and for me some sunken bar stools and bar top. ​Today there are two popular secondary swimming pool sanitation technologies available to help eliminate algae, bacteria, viruses, and protozoa in your pool water. The first is Ultraviolet (UV) pool water sanitizer which is a non-chemical process that uses UV light to eliminate organics in the water. Water is pumped from the pool into the filtration system then passed through the UV housing chamber. In the UV chamber is a powerful UV bulb that eliminates pathogens and chloramines and does not allow organic replication. Although this is a highly effective pool sanitizer, it is considered a secondary sanitation system because the system will only disinfect the water that is being pumped and passed through the system. Water in the pool that has not been pumped will still need to be sanitized for swimmer protection. The UV system combined with traditional chlorine or salt water systems is highly effective in eliminating pathogens, and the UV system will significantly reduce the need for chlorine or salt needed (30% or more) to sanitize properly. Also, UV sanitation systems are much more efficient at killing protozoa such as giardia and cryptosporidium (crypto) which is are highly chlorine resistant viruses. With the UV system eliminating chlorine by-products chloramines and the reduced need for chlorine, the UV system helps reduce chlorine irritants such as strong asthma induced chlorine smells and red itchy eyes and skin. 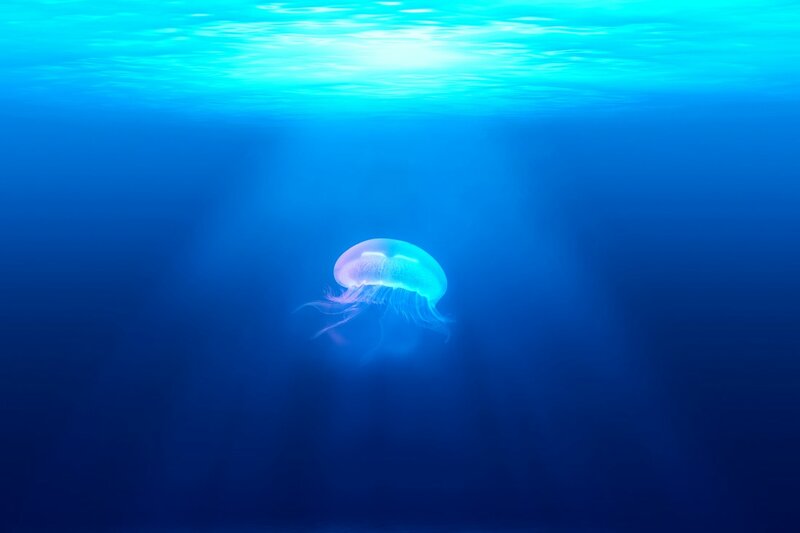 For the UV system to work most efficiently the water being treated must not be cloudy which can absorb the UV light making it difficult to sanitize. The second secondary pool sanitation system is called ozone sanitation. Ozone sanitation is set up similarly to the pump and filtration system but also utilizes a venturi system. Two different ozone process systems can be used for swimming pools. They are corona discharge and UV light. Corona discharge and UV light both create ozone (O3) through splitting oxygen (O2) molecules in the surrounding air. The single oxygen molecule attaches itself to unaffected oxygen creating ozone (O3) which is a volatile gas that is then pushed and mixed with water through the venturi system which will then kill and eliminate unwanted organics from the stream. Ozone systems are very effective, and some units can reduce the need for chlorine up to 90% or more. Ozone systems also kill protozoa up 99.9%. Like UV any water that has not been oxidized may be contaminated and will need to be eliminated through residual means such as chlorine. Better sanitation and technologies are always being tested and created, but the proven sanitation system that has killed more algae and bacteria than any other systems combined is chlorination. 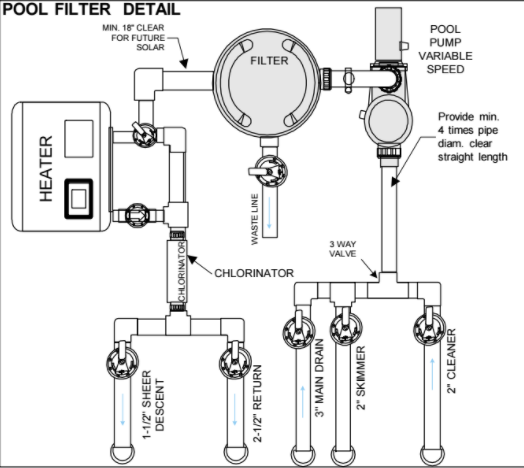 Although there has been a push for complete elimination of chlorine, it is arguably the simplest, most common and recognized system. Personally, I would opt for a combination of UV or ozone with a chlorine/salt water system just to be safe and to have a piece of mind. ​Concrete swimming pools are the oldest most reliable and durable swimming pool you can invest in, and they come with an abundant array of personal customizations and options. One of the many aesthetic options is the pool finish. Pool finishes come in a variety of material, color, and texture associated with different costs and benefits. The oldest and one of the most popular pool finishes is the classic white plaster finish. Classic white plaster is made up of white cement crush marble powder and water. When the pool is filled with water, this beautiful finish reflects a clean light blue and is very smooth to the touch. Classic white is also the least costly compared to other finishes. Some concerns of traditional white plaster finishes are that it is more susceptible to chemical attacks from improperly balanced pool water which can lead to etching, stains, and spotting when compared to more modern pool finishes. Additives such as color and chemical resistance can be added to classic white giving the homeowner more options. Some concerns when using additives is the inconsistency of color and spotting. It is imperative that you hire a professional with experience and that the homeowner or service tech correctly maintains the pool chemistry. Other more modern pool finishes have quartz, glass, or pebble aggregates that replace the white sand or crushed marble powder. Aggregate finishes can be applied to a relatively smooth finish with some natural feeling texture. Aggregate finishes with minimal exposure effort can look great and over time by natural aging and proper maintenance the finish can start to transform look and feel exposing beautifully smooth aggregates slowly. For more immediate aggregate revelation there are options to have your aggregate pool finish either polished or chemically exposed. After the aggregate pool finish is applied and partially cured, the contractor can polish the finished surface with a wet grinder/polisher with various diamond grit polishing pads. This physically removes a thin layer (microns) of plaster paste exposing the aggregate. Chemically exposing aggregates requires using a ratio of muriatic acid and water. The acid mix is poured and spread onto the finish while being brushed and washed with water chemically removing (microns) of plaster paste. Aggregate finishes are more resistant to chemical attacks because of its natural material, and they are less porous by nature making this finish option more desirable. Of course, no finish is fool proof, and by maintaining and balancing your pool water, this will ensure a beautiful finish that will last a very long time. ​Automatic pool covers are awesome, are convenient, will save you money and can keep you and your family safe! One of the biggest reason people get automatic pool covers is for safety reasons. If the pool cover is installed correctly and is undamaged, it acts as a safety net preventing accidental child and adult drowning. Covers also keep unwanted guest from getting in the pool such as bugs, animals, and the neighborhood menaces. With the increasing trend of staycations, many people will not even consider a swimming pool without a safety cover. Another big reason people go for an automatic pool cover is for the energy savings. When the pool cover is in use, it reduces water evaporation, use of less chlorine, and the need to heat the pool. With today’s energy concerns water conservation is becoming more of a concern. Chlorine also dissipates from the evaporation and sun rays. Keeping the free chlorine in the pool not only makes your pool more efficient and eliminating algae and bacteria but it also reduces having to handle, add, or produce (saltwater pools) the chlorine needed. Covers also keep debris out of the pool and will let the pump and filters run more efficiently. 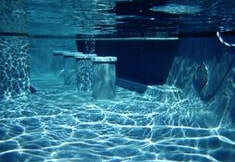 The less unwanted organics and debris in the pool the more efficiently your pool pump, filters, and chemicals will work. Covers will also keep the heat inside the pool requiring less use of the pool heater and work more efficiently than a solar cover. Another big reason people choose to include automatic pool covers is out sheer convenience and cool factor. Most homeowners just want to jump in the pool at no particular time and day without having to clean debris, balance, or wait for the pool to heat up. Also, it looks pretty cool watching the immense pool cover unveil the inviting beauty of the swimming pool! Some cons of (hidden track) pool covers are the initial cost and that they can compromise the shape of the pool. Pool cover requires a built in concrete housing and lid, the motor, cover and automation controls. Pool cover systems can range from $12,000 to $24,000. Of course with the energy savings, most pool covers will pay for themselves in 6-8 years. For under-mount hidden track pool covers to work properly, swimming pools must be of rectangular shape. This may or may not be a con since some of the most beautiful pools in the world are of rectangular shape. ​Swimming pool automation is becoming more prevalent, more convenient, and more advanced every day and there is an array of products to choose from. For example, some of the more advanced systems will allow homeowners to control pool & spa lights, filters, pumps, auto covers, landscape lighting, water features, fountains, waterfalls, bubblers, water jets, sprinklers, fans, spa jets, spa blowers, water temperature, chlorinators, salt water systems, water chemistry, and much more. The advanced systems conveniently and efficiently allow users to control these function through their iPhone or Android cell phone or tablet from just about anywhere in the world with internet service. You can even connect your voice command system such as Alexa or other similar devices to monitor or change your pool and spa area controls. You can even track the history of pH and other chemical balances of your pool and spa. Pool automation can also be linked to an existing pool and has different price and sophistication levels from simple automation controls to more far-reaching advanced controls. ​Salt water pools are becoming more and more popular among homeowners. But what is a salt water pool? A salt water pool is a swimming pool that uses dissolved pool salt that runs through a salt water generator that chemically produces its own natural chlorine that helps eliminate bacteria, algae, and other unwanted organics. Yes, a salt water pool still has chlorine in it (or produced by it) but is less harsh on the body, eyes, hair, skin, and smell. Traditional chlorine pools comprise of “free available chlorine” "total available chlorine" and “combined available chlorine.” Free available chlorine is unused chlorine to sanitize the pool, total available chlorine is the combination of used and unused chlorine, while the combined available chlorine is the difference between free chlorine and total chlorine. When combined chlorine is high by the reaction of chlorine and human sweat, skin, and other organics it creates “chloramines” which is responsible for the pungent chlorine smell. The strong smell means there is not enough free available chlorine, so the pool is not efficiently eliminating organics. To compensate we add more chlorine or shock the water. Saltwater pools continuously produce free available chlorine that helps remove chloramines through the use of a salt water generator. Of course insufficient salt and other balancing will not produce enough chlorine which can result in a less sanitized pool. Salt water pools are not free of maintenance and must be monitored to sanitize efficiently. If you are concerned about handling, transporting, and storing harsh pool chemicals such as chlorine, have breathing issues, dealt with red itchy eyes or skin, had stained clothing or dry skin or hair you may want to consider a saltwater pool. There are some drawbacks of saltwater pools, for example, the initial cost for a salt water pool is much more than a traditional chlorine pool (but may balance out in the long run). Because salt at high concentration can be corrosive to pool equipment including pumps, filters, diving boards, pool lights, etc. must be designed to resist salt water corrosiveness which can be costly. The benefits of swimming are enormous! Swimming can be counted as both aerobic and anaerobic. Swimming requires constant body movements to stay afloat which in a sense is cardio training all while pushing and pulling against the density of water which in a sense is strength training. Water also keeps your body from overheating. Because water is surrounding your body, it is continuously cooling your body depleting the heat more efficiently than if you were on dry land. Speaking of dry land exercising in the water is also much easier on your body than dry land exercising! The buoyancy of your body keeps you from bodily injury from high-impact activities such as running or weight training. Running and weight training can be very hard on your joints and back all while developing a higher risk of muscle tears. Speaking of injury water exercising can also help you recover from injury all while keeping fit during your recuperation! Because of its low impact properties, you can begin therapeutic recovery without overstressing an injury. Aquatic therapy is a very popular preference in the professional sports world and among physical therapist. Swimming and exercising in the water targets your entire body from your arms and legs to your back, glutes, and core. Swimming and exercising in the water improves and increases flexibility, strength, endurance, circulation, and heart & lungs. When swimming with your face under water, your body learns to efficiently use more oxygen while expelling carbon dioxide which in turn increases your lung capacity, endurance, and blood & oxygen circulation. As a bonus, these benefits can make you a better land runner, weightlifter, and overall athlete. There are many ways to exercise in the water including water running and walking, water yoga, flexibility and stretching exercises, using water fitness products and of course lap swimming. Of course, you do not need to call you water exercising “exercising.” Being in the water is supposed to be fun, and as an added benefit you are getting exercise. 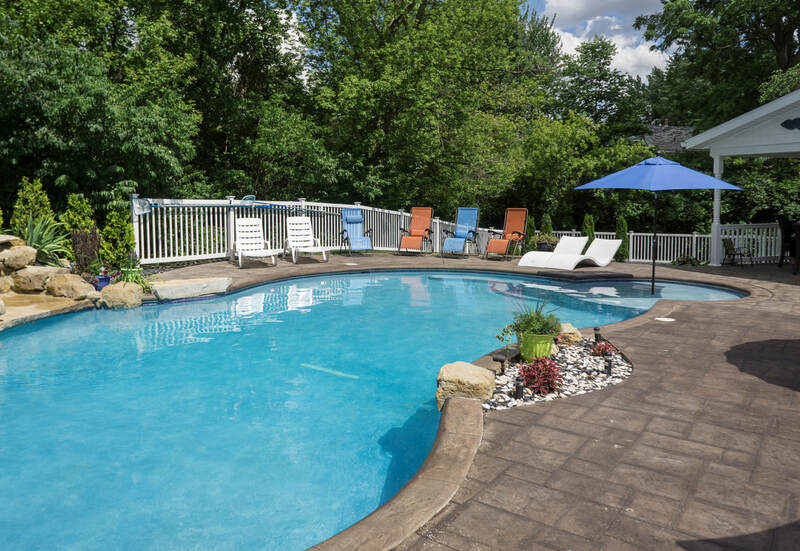 Just being social with family and friends in the pool, playing water volleyball or basketball, jumping off the diving board, or just plain messing around will be beneficial.